2014 is getting off to a pretty good start. 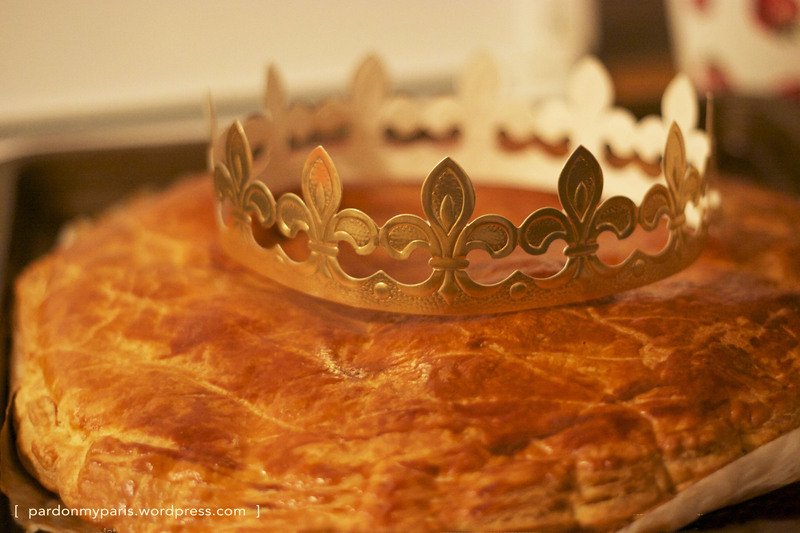 It's January and January in France means it's time to eat Galette de Rois all month long. This cake is also known as a King Cake that can be found during Mardi Gras in Louisiana. I had the pleasure of going to a Galette de Rois eating party last night, put on by my neighbors. It was fun to finally meet them after living here for almost a month. There was lots of hot wine, cider, live music, laughter and of course CAKE. I think I'm going to like this place. The Galette de Rois is my favorite dessert game, well it's the only dessert game I know of. How it's played: There is a figurine, la fève, hidden in the cake. The cake is cut into parts and served. Whomever finds the figurine in their piece is King/ Queen for the day. Most time the figurine is made of porcelain, please do your teeth a favor and use a fork. As a bonus, the cake comes with a fancy paper crown to be worn by the King/ Queen. The best part about all of this is the deliciousness of the cake. Flaky on the outside, almond on the inside and served warm. Miam! It's Jan 12th and I've eaten it 4 times and I'm having some tonight after dinner. I really don't think I can get tired of it. It's just THAT good. The eating of the cake is catholic in it's origins, celebrating Epiphany. But you don't have to be Catholic to enjoy this delicious treat! These cakes are everywhere, you can find all sizes in bakeries and at the grocery store. Yet, the best of course is when you make it at home.